Summer is coming to a close, which means school and work are ramping up again – and you want your brain to be in tip top shape to tackle important tasks and projects. Did you know that there are specific foods you can incorporate into your diet to increase your cognitive abilities such as focus, memory, problem solving skills and learning? Research has shown that certain nutrients can enhance brain function by increasing blood flow to the brain, calming inflammation and battling fatigue. Here are my top six brain boosting foods to keep you sharp, focused and on point. 1. Beets: These beautiful root vegetables have tremendous brain boosting potential because of the natural nitrates they contain. Some studies show that these nitrates increase blood flow to the brain, enhancing mental performance. My favorite way to eat beets is to roast (you lose much fewer nutrients this way than by boiling) and drizzle them with some extra virgin olive oil, Icelandic flake salt and fresh ground pepper. 2. Almonds: Nutritional powerhouses, almonds are high in Vitamin E, heart-healthy mono-unsaturated fats, fiber and protein. Vitamin E has been shown to help reduce the risk of cognitive impairment and potentially even the decline caused by Alzheimer’s. An easy way to eat almonds is to pre-portion them out (one small handful is the ideal serving size) and keep them in your car, desk and bag for a healthy snack or to swap out peanut butter for almond butter. 3. Celery: Fibrous, crunchy celery is a great source of luteolin, a plant compound that might lower rates of age-related memory loss. Luteolin calms inflammation and prevents degeneration by inhibiting inflammatory cytokines in the brain. 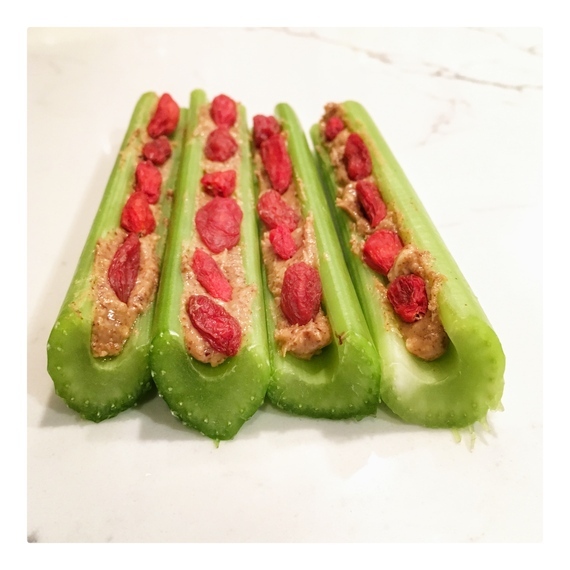 Celery is an easy food to snack on, and for an added brain boost, you can add almond butter and goji berries to it – like a grown up version of bugs on a log. 4. 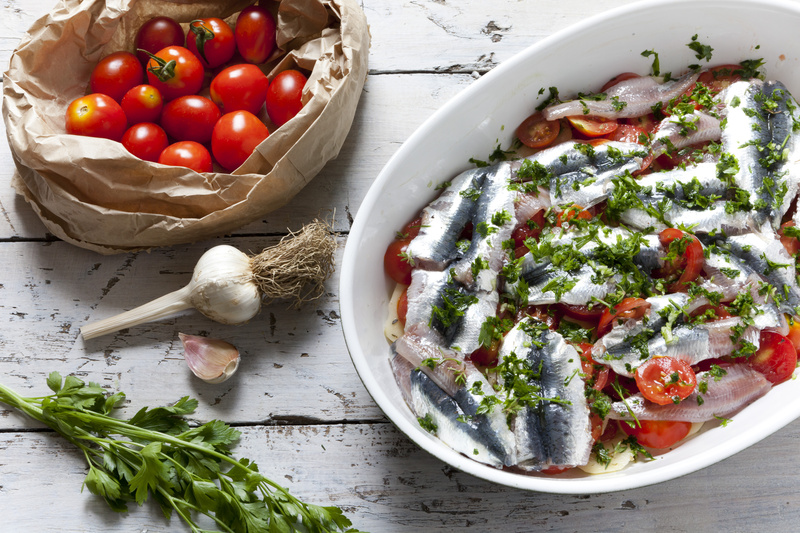 Sardines: People either love or hate these little fishes but it’s undeniable that they are a super food: full of essential fatty acids (EFAs), calcium and protein, sardines are one of the best foods you can possibly consume. The EFAs they contain are EPA and DHA, omega-3 fatty acids that act to bolster communication among brain cells and assist in modulating neurotransmitters responsible for mental focus as well as calming inflammation in the brain. EPA and DHA also increase brain levels of the ‘good mood’ chemical, serotonin. Bonus: the mercury content in sardines is one of the lowest in any fish. 5. Dark chocolate: The key here is choosing good quality chocolate that has 70% or more cacao content. The flavonols in dark chocolate improve blood vessel function, and thus increase brain blood flow. This can enhance memory, cognitive function and alertness. Dark chocolate also boasts brain stimulating caffeine and theobromine, which can help with short term cognitive functioning. 6. Green Tea: Polyphenols in green tea are thought to be neuroprotective and are being studied as therapeutic agents with the potential to alter brain aging processes. Green tea contains caffeine, though only about a third of the amount in a cup of coffee, which can also provide a short term mental boost. My favorite way to increase my intake of green tea is by eating these natural mints that contain one cup of green tea in three mints. Author Mascha Davis, MPH, RDN specializes in helping clients reach their goals.